After a 4km swim in Tooting Bec on Friday I took Saturday off to attend my amazing friend Elaine’s memorial service, it was a year ago that we lost her and as many of you know I am dedicating my solo swim next year to her memory. Having had a sad but nice day catching up with her family and other friends I headed down to Dover on Sunday in the beautiful sunshine with a view of doing a 4 hour swim. The longest I have swam without a wetsuit was last year and was just under 3 hours (although I have done 3hrs 45 with a wetsuit) so I thought this would be a good stepping stone and having spoke to Freda we agreed I would aim for 4 hours. Freda originally challenged me to 6 but I negotiated down to 4 as this seemed more where I should be aiming for at this stage. 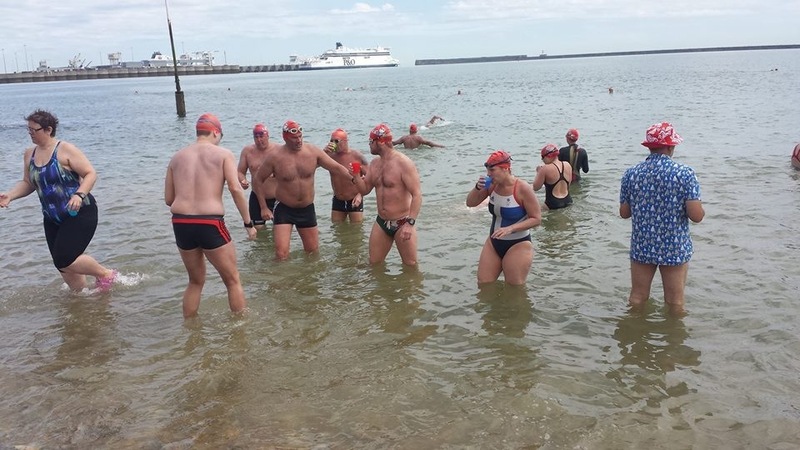 Dover beach is a great way to meet those that have already swam the channel and those that are currently training to as well as those with other swimming challenges including; Lake Zurich, Swim around Jersey and Loch Lomond. It is such a great source of information and as I am getting to know more people I am learning a huge amount about both the 2 way relay that I will be attempting with Paul, Parviz and Hilary this year and my solo. As I would be swimming for more than 2 hours the team at Dover put in place a feeding scheme which meant that after 2 hours we would feed and then every hour after that. By feed I don’t mean a meal of any sorts! It compromises of a jelly baby (or piece of chocolate if you are lucky) and a maxi solution mixed with warm water and that is it! The first two hours I was struggling to keep warm despite the sun on my back and swam on and off with my friend Charlie which although swimming is a pretty unsociable sport (during swimming not after :)) but it is good to have someone there from time to time. I had also bumped into one of my two way relay team as he had come down for a swim to see how he would get on in the cold water after being in the States for a few weeks. As it came up to the first feed time I headed in and grabbed my jelly baby and drink and then off I went. After this each hour went very quickly and as I got to my third hour I started thinking that perhaps I should try for five hours. My shoulder was aching slightly but nothing too bad and as my fourth hour went really quickly I decided that I was going to go for it whilst I was feeling so good. I had a quick chat to the team as I came in for my feed and they agreed that I should go for my five hours. As I swam on I started wondering if I should go for six! The six hours would mean that I would qualify for my solo swim next year. As I got to the last 15 minutes my shoulder started twinging and I made the call to call it a day. This was by far my longest ever swim without a wetsuit and given that my training this year has all been under two hours this was a massive boost for my confidence. I feel much more confident now about the solo and the two way relay. I know that I could have done my six hour as I came out feeling really good, which was in my head a huge task and my plan was to get it done by around August so I am well ahead of that…. perhaps this weekend. However, 6 hours is still a relatively small swim compared to the task in hand which could take anywhere from 14 plus hours depending on weather, tides, currents etc. so I certainly cannot rest on my laurels as I still have a long way to go but it was a big step for me both psychologically and physically. This weekend I am heading down with my friend Vicky for both Saturday and Sunday (She has her solo attempt in just 3 weeks). My two way relay team will also be down on Saturday so although they don’t get in the water till 10am I will aim to be around the swimmers beach as they enter so I can swim with them for an hour or two. This entry was posted in Swimming and tagged Channel Swimming, Dover Harbour, English Channel, Open Water Swimming, swimming, Tooting Bec Lido. Bookmark the permalink.